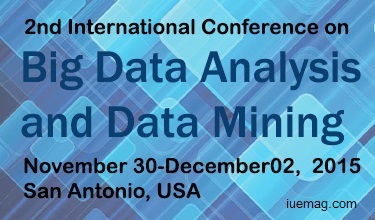 The 2nd International Conference on Big data analysis and Data Mining during November 30 – December 01, 2015 San Antonio, USA is the opportunity to discuss, share and explore through the accelerating research and advances in Data Mining. The aim of Data Mining-2015 is to revolutionize the information sharing on scientific researches and to accelerate technological transformations by bringing together a group of scientists and engineers.It is the platform to present and exchange breakthrough ideas relating to the field of predictive analysis, machine learning, artificial intelligence, cybernetics, data warehousing, data visualization, application of data mining in medicine, informatics, retail industry and many more. It would promote knowledge and improve the research quality by globalizing the experiences, presentations and contributions by renowned speakers, thereby focusing on the outstanding achievements and advancesin the field of Data Mining. The event extends its heartfelt gratitude to our honorable Organizing Committee Member, Dr. Alex Vasenkov for conducting an on-site workshop during the conference and show light on the Analytical tools for handling the complexities of Big Data. Omics Group is honored to have Inspiration Unlimited eMagazine for being the collaboration partner for the upcoming Data Mining-2015. The conference is comprised of 7 tracks and 48 sessions designed to offer comprehensive sessions that address current issues in Data Mining and Big Data market. The big data market has been achieving strong revenues. The Global Market Statistics shows that it has reached a revenue height of 7.39 USD (billion), 7.15 USD (billion) and 4.12 USD (billion) for services, hardware and software, respectively for the year 2013. The global market statistic also shows a revenue forecast for the global big data market from 2011 to 2017. For 2016, the source projects the global big data market is predicted to grow to more than 45 billion U.S. dollars in revenue. It is a platform for the students to come up with new ideas and presentations by being a part of the Young Research Forum and learn from each other and gain knowledge from senior researchers and speakers at the conference. The upcoming conference organized by OMICS International is both Academic as well as Business oriented as because it would also throw light to the applications and recent outbreaks in Data Mining in the present era of Science and Technology. It would deal with the practical application and showcase the use of products developed by various companies in dealing the complexities of Big Data.Thereby, presentation and exhibition of various analytical softwares and tools along with Business development ideas from data scientists and professionals is highly welcomed to the conference. Any facts, figures or references stated here are made by the author & don't reflect the endorsement of iU at all times unless otherwise drafted by official staff at iU. This article was first published here on 4th November 2015.